Thousands of teachers from across Kentucky gather outside the state Capitol to rally for increased funding and to protest last minute changes to their state funded pension system, April 2, 2018, in Frankfort, Ky.
Tens of thousands of teachers in the U.S. states of Oklahoma and Kentucky took to the streets Monday, demanding better pay and more funding for education. Classrooms in both states — Oklahoma in the southwestern part of the country, and Kentucky in the mid-South — were shuttered, some because of the teacher walkouts, some because of scheduled spring breaks. The teacher protests in Oklahoma City and Frankfort, the capital cities of Oklahoma and Kentucky respectively, mirrored a similar nine-day strike in West Virginia, where teachers recently won a pay raise to end their walkout. In Oklahoma, with the third-lowest teacher salaries among the 50 U.S. states, the protesters said funding concessions made by state lawmakers last week were not big enough to improve education there. Some school systems only hold classes four days a week for lack of funding for a five-day week and use 20-year-old textbooks. 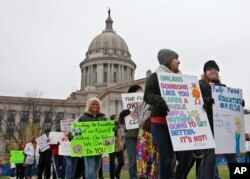 Teachers picket around the Oklahoma State Capitol in Oklahoma City, April 2, 2018, as teachers rally against low school funding. The Oklahoma teachers' union is demanding $10,000 raises for teachers, $5,000 pay boosts for support staff and $200 million in new education funding. But state lawmakers only agreed to smaller amounts: a $6,100 teacher pay boost, $1,250 for support staff and $50 million in new education funding. Even with the pay boost, some Oklahoma teachers said they have to take on second and third jobs, such as working at restaurants or mowing laws, in order to make enough money to pay their household bills. In Kentucky, teachers protested changes to their pension plans that lawmakers tucked into a bill about sewage and demanded more state funding for school systems. The teachers decried the fact that there is no change to cost-of-living adjustments to their pensions and that they will have a limited number of sick days they can put toward their retirement.